Marblo is a contemporary resin based composite material that is excellent for engraving. We use laser engraving, sand blasting or cnc router engraving depending on the project. Fisheries Ruler: This one meter long ruler was engraved and paint filled for the Department of Fisheries. Precision measurement was critical in this engraving. Material use was 10mm translucent frosted Marblo. 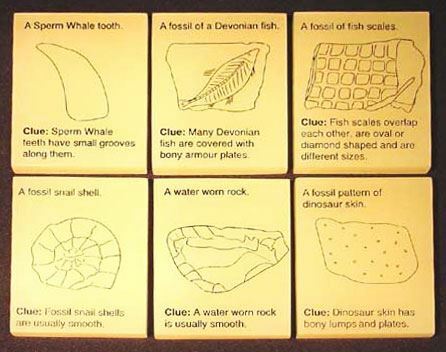 Fossil Game: Commissioned by the Australian Museum these Cream coloured Marblo slabs have been sand blast etched and paint filled to create a fun child's education tool. "Marblo" solid surface is the most stain resistant and easily repairable solid surface material available on the Australian market. Environmentally safe with a wide range of colours and patterns to choose from, "Marblo" solid surface is made in Western Australia by Marblo Products Pty Ltd. This Polyester based product has fast become Australia's most sought after material because of its versatility and flexibility in the fabrication process. This means greater scope for design initiatives and reduced costs due to ease of use. "Marblo" solid surface has primarily been used in Commercial applications such as food halls, laboratories, restaurants and professional offices.